View of the Yampa Valley via an eight-passenger gondola car. The gondola will take you to the mountain mid-point where you can hike, bike, or simply enjoy lunch while taking in the spectacular panoramic views. Whether it&apos;s wildflowers in the summer, or the changing aspen leaves during the fall, this is a memorable way to experience Steamboat. 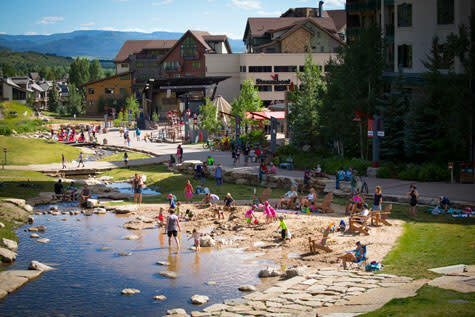 The base of Steamboat Ski Resort is transformed in the warm and sunny summer months into a natural playground filled with fun and entertainment. From scenic gondola rides to more than 50 miles of trails prime for hiking and both cross country and downhill mountain biking, there’s no shortage of opportunities to explore Mount Werner. Find your beach at the base of Steamboat Ski Area in the cool, clear waters of Burgess Creek, which meanders by Gondola Square at a perfect depth for splashing around with the little ones. Stake out an Adirondack chair at the popular Burgess Creek Beach, where you can sunbathe and watch as your kiddos play in the sand and explore the mini waterfalls while emerald mountains provide a picturesque background for the perfect summer day. Next to the creek in Gondola Square, the Steamboat Stage is a town favorite entertainment venue bringing outdoor movies on the big screen to national touring acts. Kids (and sometimes their parents, too) will jump for joy at the rides of The Land Up. Enjoy a friendly round of mini golf with the family at Steamboat’s new 18-hole course, Maverick Mini Golf. Or for those seeking more thrills, try out the Outlaw Mountain Coaster. The Outlaw is the longest coaster in North America boasting over 3,500 vertical feet of dips, waves, turns, and 360 degree circles. 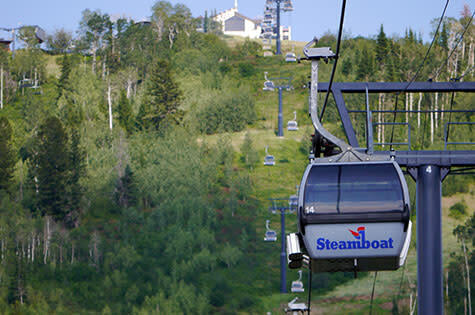 At the Steamboat mountain base area, your summer adventure awaits. The base of Steamboat Ski Area is not the only part of the resort you can enjoy in the warm months. Try riding the gondola in the summer for breathtaking sunset views and other activities at the top of the mountain. For more information on ticket pricing, the Steamboat Bike Park and other mountain specific activities, visit the Steamboat Ski Resort website at the link below. From cocktails on the patio with Mt. Werner as your backdrop to delectable meals from one of our fine dining establishments, there is an assortment of dining options at the mountain area. Visit the link below for a list of restaurants within walking distance of the gondola and base area. The base area is buzzing with events throughout the summer. Be sure to mark your calendar for the below. View the links below to see the calendar for each ongoing event series held at the base area this summer.